"Sports : MLB Extra Innings : Slideshow : Header"
"Sports : MLB Extra Innings : List : Header Title"
"Sports : MLB Extra Innings : List : Intro"
Major coverage of the Major League. Experience Major League Baseball® like never before with MLB EXTRA INNINGS®. You'll get almost 90 out-of-market games a week^, most of them available in crystal-clear HD*. 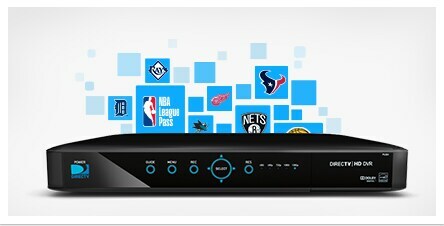 When it comes to MLB®, DIRECTV has you covered. "Sports : MLB Extra Innings : List : MLB.TV"
Stream your favorite teams on any device. 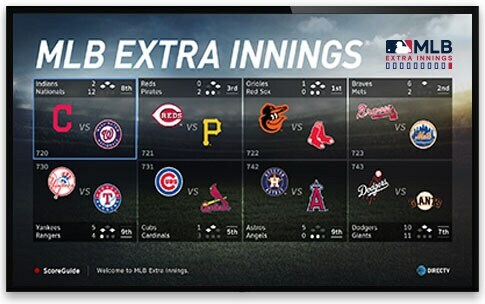 MLB.TV is included with your MLB EXTRA INNINGS® subscription. Stream every out-of-market game LIVE or on demand on your favorite supported devices. At home, in the office, or on the go – MLB.TV is baseball everywhere. Online access is only available on certain operating systems. Computer hardware, software, and Internet connection not included. Mobile access only available on certain devices. Additional data charges may apply. Please check with your service provider. Visit www.mlb.tv/support for a list of system requirements and compatible mobile devices. "Sports : MLB Extra Innings : List : Games"
Preview up to 8 games at once. "Sports : MLB Extra Innings : List : MLB Network"
Catch live look-ins, breaking news, interviews, and instant analysis of every game. Plus, live games five nights a week. MLB Network (ch 213) is the ultimate television destination for baseball fans. MLB Network is not included in MLB EXTRA INNINGS℠. Learn how to get MLB Network. "Sports : MLB Extra Innings : List : StrikeZone"
MLB Network Strike Zone (ch. 719) gives you a high-speed look at every MLB game across the league during the regular season. Tune in Tuesdays and Fridays to watch up-to-the-minute highlights, live look-ins, and updates. All commercial free! 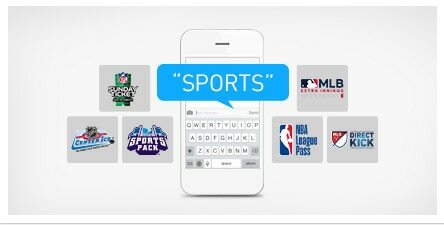 "Sports : MLB Extra Innings : List : Sports Package"
Activate MLB EXTRA INNINGS with a simple text message. Just text "MLB" to 223-322 and follow the prompts. With Genie, our most advanced HD DVR ever, you can choose what teams you want to follow and find their game listings all in one place.
" Marketing:Packages:MLB Extra Innings:Top Questions"
How to activate your account with MLB.TV with MLB EXTRA INNINGS. Is MLB.TV included with MLB EXTRA INNINGS? How do I start using MLB.TV? Can I watch movies and shows on my favorite network’s website? All local and national blackout restrictions still apply. In other words, subscribers within a team's Home Television Territory cannot get that team's games in this national package. In addition, due to the national exclusivity of both FOX and ESPN, there are no games available for distribution via this package on Saturday day or Sunday night, respectively. Please see the below for further detail. If you live in a ZIP code that is within a Major League Baseball team's territory, that team's games will be blacked out from the MLB EXTRA INNINGS game package, but will generally be available as part of your regional sports network or team's over-the-air affiliate television station. Blackouts protect the local rightsholders who arrange separate distribution agreements with the teams for their exclusive territories. Due to an agreement between Major League Baseball and ESPN, any out-of-market Sunday game that begins after 5:00 p.m. ET will not be available with the MLB EXTRA INNINGS℠ package. Due to an agreement between Major League Baseball and FOX Television Network, any out-of-market Saturday game that starts within 3 hours before or after the start of a game broadcast on FOX will not be available with the MLB EXTRA INNINGS® package. • If FOX broadcasts a game starting at 1:10 p.m. ET, any other game starting before 4:10 p.m. ET will not be available with the MLB EXTRA INNINGS® package. • If FOX broadcasts a game starting at 4:10 p.m. ET, any other game starting between 1:10 p.m–7:05 p.m. ET will not be available with the MLB EXTRA INNINGS® package. • If FOX broadcasts a game starting at 7:10 p.m. ET, any other game starting between 4:10 p.m–10:05 p.m. ET will not be available with the MLB EXTRA INNINGS® package. Now included in your MLB EXTRA INNINGS subscription at no extra charge, MLB.TV. You can now watch LIVE baseball on every mobile device. Get almost 100 out-of-market games per week with 99% in HD. For a full list of supported devices please visit http://mlb.mlb.com/mobile/atbat/devices.jsp. Start enjoying MLB EXTRA INNINGS and MLB.TV! 2015 Major League Baseball Properties, Inc. All rights reserved. Major League Baseball trademarks and copyrights are used with permission of the applicable MLB entities. Visit MLB.com. MLB.TV subscription required to watch live and archived games. Blackout and other restrictions apply. Blackout restrictions and other conditions apply. ^Actual number of games varies by market. ** For full Mix Channel and interactive functionality, HD equipment model H/HR 21 or later is required. Mix Channel availability subject to limitations. Sports subscriptions cannot be canceled, transferred, refunded, or credited (in part or in whole) after the season starts. MLB EXTRA INNINGS subscription will renew automatically each season at the then prevailing rate (currently $172.74/season) unless you call to change or cancel by the date specified in your renewal notice. Up until the season starts, you can cancel anytime and receive any applicable refund. To receive sports programming, a DIRECTV subscription is required. Commercial locations require an appropriate licensee agreement.